The lilac is blooming. Ours barely smells. 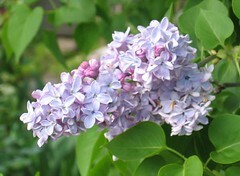 DH says the ones that he grew up with, in the Boston area, smelled heavenly. This tree was in our yard when we bought the house. It’s one of the few things that we’ve kept. I finishe DH’s windpro sweatshirt. He wants vests, now. Out of windpro, with zippers; the zipper part is not a problem. The windpro might be. It’s not like I find it readily available. I hate to go no “no mail” on the fabric and notions mailing list because I’ll be very tempted to buy more fabric. Oh, well, we shall see. I finished Kwik Sew 2529. I had started it last May, so it took me almost a year. I like them, and I think they will work for wearing under skirts, but I need to lengthen the legs more. One really good thing about them is that I can get them to fit my waist without squeezing the dickens out of my thighs. What’s interesting is that this is the first time for as long as I can remember that I don’t have anything cut out and waiting for me in the to-do pile.